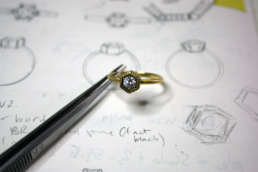 The heart of the design is a recycled 0.26 carat old cut diamond set in a solitaire hexagon setting. 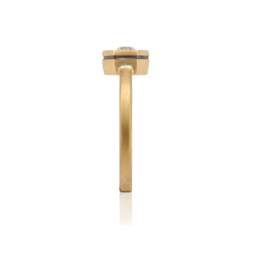 The metal is 18k yellow Fairtrade Gold with a matte finish and black rhodium plated detailing. The clients were after a contemporary design, but also wanted to incorporate stone setting techniques and decorative details reminiscent of Victorian and Georgian jewellery. The diamond was inherited from the client’s grandmother and originally set in a broach. 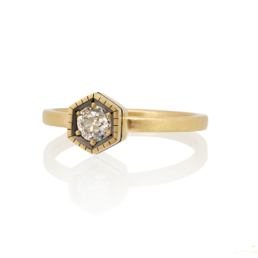 The hexagon geometry crisp and softened by the details within the shape such as the delicate grain setting, the golden border with engraved lines, and the black rhodium plating.